Did you know that the reason we have this "late blight" is more than likely from the "importation" of tomato plants from the state of Georgia? Who brings them in? Well, surprise, surprise! It is usually the Big Box stores! This reaffirms why you should try to buy your plant material from a local grower. If the plants are raised locally you can be sure that they will survive and thrive in your garden. And now, another good reason...they don't import diseases we can do so much better without! I know it's tempting to buy plants from these huge stores. The prices are great...but now all the tomatoes with late blight have to be torn out of the ground and thrown into the garbage...harvest included. Now how much of a bargain was that? This late blight affects potatoes as well. If just ONE infected potato remains in the ground...it will reinffect any potatoes planted there next year! What a literal pain! This also graphically shows the benefit of rotating your plants! 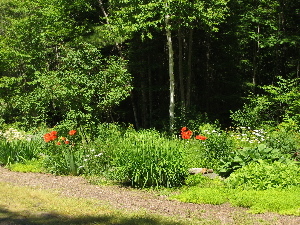 Move plants around in your vegetable garden year to year, unless they are perennials like rhubarb and asparagus. Here is a link from Cornell Extension with pictures and more information. Now, here's a fun idea...or two! This morning I had a question from a New Hampshire gardener who is having trouble with her viburnums. They are being consumed by a little bug that she cannot seem to control. 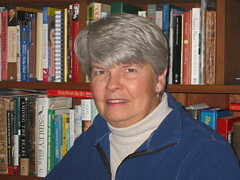 I did a little research and found a website from Penn State Extension. Click here to find out how to identify and deal with this pest. Make a comment below if you are experiencing a similar issue. It might help other gardeners figure out how to successfully deal with this bug that is devastating viburnums throughout the northeast. I have another Osier Dogwood on our property. It's FAR away from the first, but I figured I better check it out and see if it shows any infestation of Dogwood Sawflies. The leaves do have some little eggs. There were also one or two recognizable sawflies visible as well. Out came the Sevin again yesterday. Hopefully, we've solved that problem. Of course, the eggs are not going to be eating anything until they hatch out, but it's hard to convince my husband of that. He sprayed! Depending on how quickly they move along in their metamorphisis, and if the weather cooperates and doesn't rain for a few days...maybe the Sevin will be there to greet them for breakfast. I'll keep you posted. The first Dogwood, although devoid of many leaves, is beginning to look better. There are new, little leaves popping out with NO sign of re-infestation. You can be sure I'll keep an eye on it! The last two weeks have been a challenge for my Red Osier Dogwood. All of a sudden this tree began to look absolutely terrible. The leaves were being eaten and the tree was looking pretty sad. On closer observation I could see there were TONS of little ashen, grayish-white caterpillars. There were as many as 10 little caterpillars on each leaf, curled into a little ball. UGLY and obviously being totally destructive to the tree. In two days I watched as the tree was totally decimated. Oh, oh! This was NOT a good thing. I looked up caterpillars on the internet and could find NOTHING that looked like these little characters. I was flummoxed. Off I went to Agway, which was on my way to the UNH Extension Office. I thought MAYBE they would have a clue...or maybe it was some new introduction to NH gardens. The folks at Agway were as confused as I. I was all set to buy some BT with which to spray them but held off. I thought it would be better, in case there was another treatment that would work better. I surely didn't want to double treat anything. So, the BT remained on the shelf. Off I went to the Extension office with my little jar of caterpillars. None of the "experts" were there, so she took the jar and disappeared to take some photographs which were sent to the NH Entomologist, Alan Eaton. She requested a quick reply. By the next morning, I had my answer. The reason I couldn't find this caterpillar was that it was NOT a caterpillar! Instead, it was a sawfly, a dogwood sawfly in fact. It was good I didn't get the BT, because it would have been totally useless and ineffective. Here is the response I recieved from Alan Eaton. "The insects are dogwood sawflies. They are not caterpillars, even though they look similar. 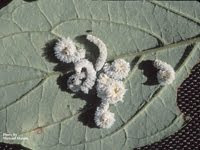 The distinction is important, because a common, effective biological control used for caterpillars (Bacillus thuringiensis spray) will not affect these insects. Various chemical insecticides registered for backyard ornamental plants will work on these, including Sevin, and products containing permethrin and other pyrethroids. ... "When fully grown (soon, by the looks of the photo) they look for rotting wood in which to burrow and pupate. 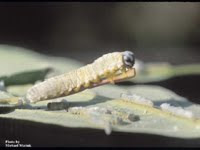 Sometimes if the affected bush is touching a building, they can burrow into composition board or other soft-ish material, as they look for a pupation site." There you have it! Here is a link to have a look at what these critters look like. By the way, we sprayed the tree with Sevin, and by the next morning, all the sawflies were dead on the ground around the dogwood. Whew! Order your spring bulbs if you haven't already! Have you any Hosta? Are there slugs chewing them? Try this solution, if you haven't already.